The Write module is used to render and output the connected image information. 1. In the Module Library, go to the IO tab. 2. Select the Write module and drag it to the Network view. 3. 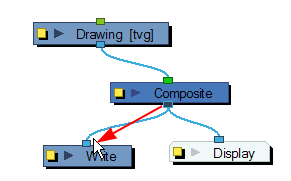 In the Network view, connect either the final Composite module or any other module which outputs an image you want to render out to the Write module. Using the Write module, you can export your project in both QuickTime movie and image sequences. You can export one format at a time, or both simultaneously.